I bought this slag glass lamp a few years ago at a charity auction. I don't know a thing about it, so if you do I would love to know more. I was so surprised when I took the back off of the small picture and found out it was a tobacco card from Richmond Straight Cut Tobacco. Written on that back is an inscription that indicates it was given as a gift in '01.......NOT 2001! Can you believe I got it at a Salvation Army for $.99??? I don't know anything about its value, as I haven't been able to find another one like it. Last is my latest wonderful old thing!! 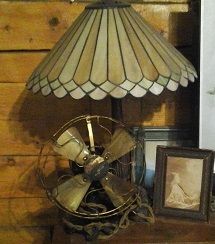 A friend sold me this brass fan. I've wanted one for a long time but never thought I would get one this cool! !